If you're considering getting an ECOVACS Deebot floor cleaning robot, you may find this article useful in helping you with selecting the right Deebot robot for your home. Note that ECOVACS has produced a large number of vacuuming and mopping robots, and therefore, to simplify your task of choosing the right robot for your needs, we will only consider the most popular and best rated ones bought by Amazon customers. 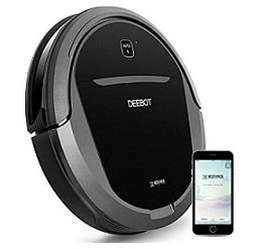 At the time of this writing, the most popular and best rated ECOVACS Deebot robots in the Amazon vacuuming & mopping category were Deebot N79, Deebot N79S, Deebot M80 Pro, Deebot M81 Pro, Deebot M82, Deebot M88, Deebot R95 and Deebot OZMO 930. Considering the amount of features that come with each of these robots, they represent some of the best budget robot vacuums available today. This article will compare the Deebot N79, N79S, M80 Pro, M81 Pro, M82, M88, R95 and Deebot OZMO 930 robots. Otherwise, please read on below for a detailed comparison of the above listed Deebot robots. 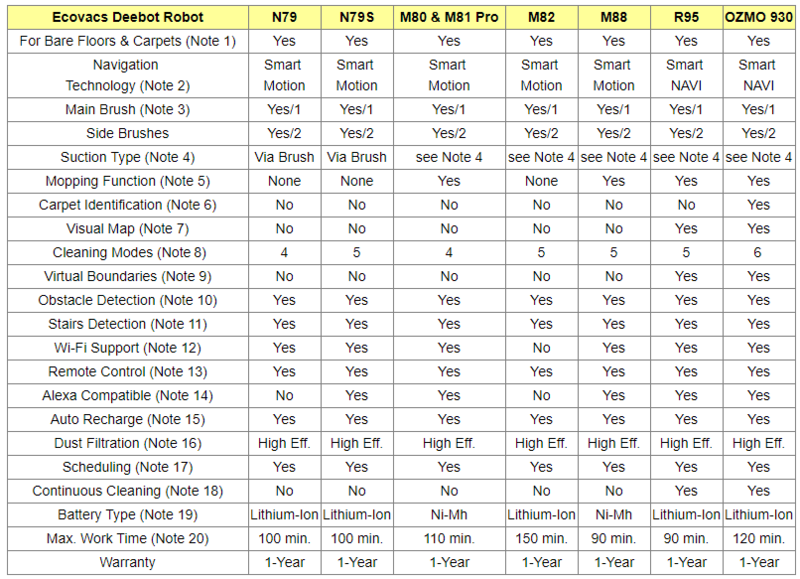 ​The following table compares the Deebot N79, N79S, M80 Pro, M81 Pro, M82, M88, R95 and OZMO 930 robots. 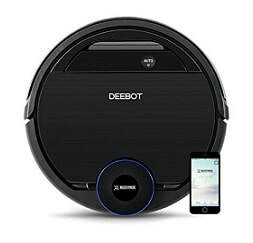 All Deebot robots considered here are equipped with a rolling main brush and therefore can be used not just on bare floors, but on low-pile carpets as well. Smart motion technology simulates human cleaning patterns through repetitive moves, covering the floors multiple times, ensuring that persistent dirt and debris are thoroughly removed. Smart NAVI technology found on Deebot R95 and on Deebot OZMO 930 uses both SLAM (Simultaneous Localization and Mapping) and LDS (Laser Distance Sensors) technologies to scan the environment, set up a virtual map, and plan the cleaning path accordingly for thorough and effective cleaning of the targeted area. All Deebot robots are equipped with a rolling main brush that can achieve deep cleaning by lifting thoroughly dirt and dust, especially on carpets. As explained in Note 4 below, some of these Deebot robots allow the removal of the main brush for direct suction in order to lift effectively pet hair and debris from bare floors. Deebot N79, N79S and M80 Pro use suction with the main brush. Deebot M81 Pro, M82, M88, R95 and OZMO 95 have two interchangeable suction options: they give you the option of direct suction (without the main brush) or suction with the main brush. Choose the main brush option to achieve a greater lift and deeper cleaning, especially on carpets, or easily switch to the direct suction by removing the main brush for vacuuming up hair and debris from bare floors without tangling. Deebot M80 Pro, M81 Pro, M88, R95, OZMO 930 robots have an optional mopping system that uses a wet/dry cleaning cloth attached to a built-in reservoir. Once the cloth is attached and the mopping mode is selected, the wet/dry mopping system dampens the cloth pad with liquid from the reservoir, mops the floor and then dries it to a sparkling shine. While mopping, the robot makes sure that only minimal water is being used, keeping the wet mop damp and wiping with the dry mop to protect your hard floors, so they stay dry after the mopping. 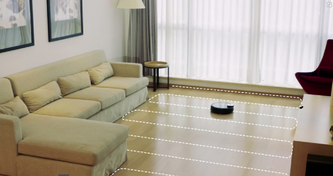 Note that OZMO 930 comes with an additional feature not available on any of the other Deebot robots: It is equipped with sensors that allow the robot to detect the type of floor it is working on, bare or carpeted. So, when the mopping function is turned on, the robot automatically switches to mopping mode when working on bare floors, or stop dampening the cloth when on carpets, so as to guarantee a safe and deep clean. This feature is further explained in Note 6 below. 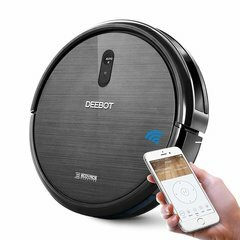 Deebot OZMO 930 can mop and vacuum at the same time, but it uses ECOVACS’ latest technology, Adaptive Floor Sensing (AFS) to detect the floor type, so it knows when to mop and when just vacuum. So, OZMO 930 will avoid mopping carpets when the mop pad is attached without any intervention from you. And when the robot is on carpet, AFS will increase suction power automatically for a deeper cleaning. 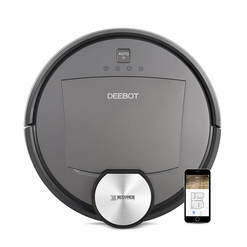 With Deebot R95 and Deebot OZMO 930, you can generate a visual map that can be used to assign cleaning tasks to the robot, monitor the actual position of the robot, check the floor coverage and cleaning status, create virtual boundaries, etc.. To see the visual map, you need to use the associated App on your smartphone or tablet. N79: 4 modes – Auto, Spot, Edge, ​Single Room cleaning modes. N79S: 5 modes – Auto, Spot, Edge, ​Single Room and Max Power cleaning modes. M80 Pro: 4 modes – Auto, Spot, Edge, Intensive cleaning modes. M81 Pro: 4 modes – Auto, Spot, Edge, Intensive cleaning modes. M82: 5 modes – Auto, Spot, Edge, Single Room and Max Power cleaning modes. M88: 5 modes – Auto, Spot, Edge, Single Room and Max Power cleaning modes. ​R95: 5 modes – Auto, Spot, Selective Area, Continuous and Restrictive cleaning modes. OZMO 930: 6 modes – Auto, Spot, Selective Area, Carpet, Continuous and Restrictive cleaning modes. Auto cleaning mode: For general cleaning. Spot cleaning mode: When intensive cleaning of a specific small area is required. Edge cleaning mode: For cleaning specific edges. Single Room cleaning mode: To eradicate the dirt in one single room. Intensive ceaning mode: To get rid of intensive stiubborn dirt. Max Power cleaning mode: For a deeper cleaning by increasing the rotating speed and enhancing the suction power. Selective Area cleaning mode: Allows defining areas to be cleaned and areas to be left alone. Carpet cleaning mode: When OZMO 930 detects that it is working on carpets, it automatically boosts the suction power for deeper more thourough cleaning. Continuous cleaning mode: Allows the robot to automatically start and continue the cleaning where it was interrupted after the robot recharges itself at home base. Restrictive cleaning mode: Allows the setting of virtual boundaries so the robot will not enter off-limits areas. 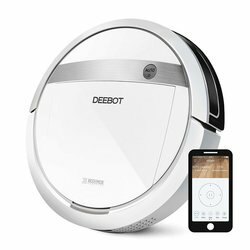 With Deebot R95 and Deebot OZMO 930, to prevent the robot entering certain rooms or areas not to be cleaned, virtual boundaries can be set using the App and the visual map. This feature is not available on the other Deebot robots. All Deebot robots considered here are able to move safely around your home using smart anti-collision sensors to detect objects in their path and navigate around them, for uninterrupted cleaning. If the sensors detect an obstacle, the robot will slow down, and select a new cleaning path. All Deebot robots considered here are equipped with 3 types of anti-drop sensors that can detect a drop-off larger than 3.1 inches. Therefore, these robots can clean up to and around stairs without the risk of falling. With Deebot N79, N79S, M80 Pro, M81 Pro, M88, R95 and OZMO 930, when the robot is connected via Wi-Fi to your smartphone or tablet, you can use the associated free App to invoke remotely the various operations available, such as scheduling and operating the robot, viewing the status of cleaning jobs, and customizing your cleaning preferences. M82 can be remotely controlled inside your home using the remote-control device that is provided (no Wi-Fi needed). N79, N79S, M80 Pro, M81 Pro and M88 can be remotely controlled inside your home using the remote-control device that is provided (no Wi-Fi needed), but they can also be controlled from anywhere using your smartphone or tablet and the ECOVACS App (Wi-Fi needed). R95 and OZMO 930 can be remotely controlled from anywhere using your smartphone or tablet and the ECOVACS App (Wi-Fi needed). When battery power gets low, all Deebot robots considered here automatically return to recharge, all by themselves. 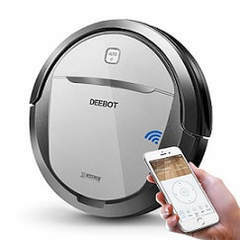 But only Deebot R95 and OZMO 930 can restart automatically to complete the cleaning job after they go to recharge themseves at the docking station. All Deebot robots considered here are equipped with a High Efficiency Filter which allows the robot to reduce airborne pollutants associated with allergies and asthma. As the robot vacuums up dirt, pollen, dust mites, pet dander, mold spores and hair, the high efficiency filter attached to the dust bin outputs freshened air. Deebot N79, N79S, M80 Pro, M81 Pro, M82 and M88 can all be scheduled to clean automatically once a day, 7 times a week, even when you are not there. Deebot R95 and OZMO 930 can be scheduled to vacuum automatically at a specific time twice a day, 14 times a week. Deebot N79, N79S, M80 Pro, M81 Pro, M82 and M88 need to be restarted after they recharge themselves at their docking station. 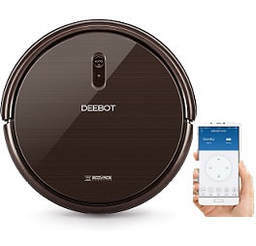 But Deebot R95 and Deebot OZMO 930 are able to resume automatically the cleaning job where it was interrupted before going to recharge. They continue this way until the job is done and the entire level of your home is cleaned! . Note that Lithium-Ion batteries are designed to provide longer cleaning sessions and last longer than Ni-Mh batteries before needing to be replaced. ​​So which ECOVACS Deebot vacuuming robot is best for your home? If you wish to be able to control your Deebot from your smartphone, you should consider either N79, N79S, M80 Pro, M81 Pro, M88, R95 or OZMO 930 which support Wi-Fi communications. If you wish your deebot to be compatible with Alexa, you should consider either N79S, M80 Pro, M81 Pro, M88, R95 or OZMO 930. If you also want your bare floors also mopped, you should consider either M80 Pro, M81 Pro, M88, R95 or OZMO 930. If you want to have the option of removing the main brush for direct suction which is good when there is a lot of pet hair and debris on bare floors, you should consider either M81 Pro, M82, M88, R95 or OZMO 930. They are the only ones that do not need to be restarted to resume the cleaning after they go to the docking station to recharge. They restart automatically and resume the job where it was interrupted before going to recharge. That is a great feature for larger homes that require the robot to recharge a number of times. With this feature, you will not have to restart your robot after each recharge; and after each recharge, the robot will resume the cleaning where it was interrupted. They are the only ones that allow setting up virtual boundaries, so the robot will not enter off-limits rooms and areas. They are the only ones that talk and give you voiced warnings. Note also that OZMO 930 is the only Deebot that recognizes the floor type that it is working on (bare or carpeted). When it detects that it is vacuuming on carpet, it will stop mopping and it will increase the suction power for a deeper clean of the carpet. Finally, note also that the main differences between N79 and N79S are the Max Power suction mode and Alexa compatibility features that come with N79S and that are not available on N79. The prices shown on the Amazon link images below may not be the latest prices, please click the Amazon link images to see the latest price information or to purchase. ECOVACS has more recently introduced a new Deebot floor cleaning robot: The Deebot R98. - It empties the dustbin automatically when it gets full. This is a unique feature in the floor cleaning robots market! - It also comes with a cordless canister vacuum cleaner and an array of attachments for integral home cleaning. 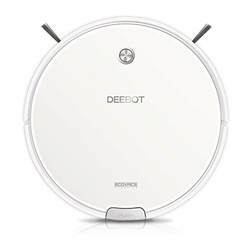 Deebot R98 is a multi-purpose powerhouse, able to clean and mop all day. And with the included handheld vacuum, this DEEBOT can cover every last inch of your house. Plus the R98 will return to its base, empty its dustbin automatically and recharge before resuming by itself the job where it was interrupted. All this with multistage vacuuming, mopping, as well as the innovative mapping features with the Ecovacs app.